The screenshot above is hosted and provided by passport-photo-software.com. Please contact them directly for any copyright infringement as we are not responsible for that content. Last Update: 2018-09-19 - Major Update: ID types database updated. Support of embedded color profile. Import from Canon Camera Control. Minor improvements and bug fixes. Passport Photo Maker is designed to help you automate the process of creating ID photos for passports, visas and other documents, so that there is no need to go online and look for the information about dimensions, head size and resolution. The program offers a wizard-driven interface letting you go through the image processing step by step, from selecting the required photo type and marking facial points for auto-cropping to retouching the image and changing background. Photos created in this passport photo software are always accepted by authorities. 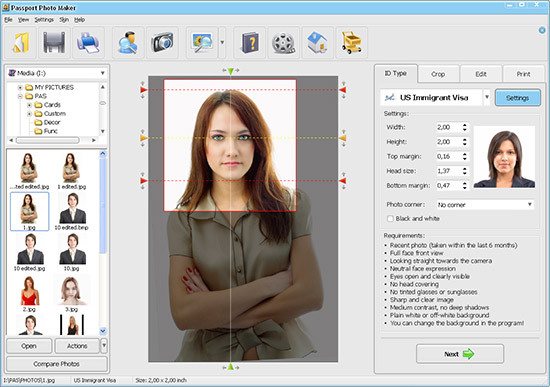 Unique to Passport Photo Maker is a built-in database of templates based on the standards of ID photos and specific requirements established in many countries, such as USA, Canada, UK, France, Italy, Spain and many others. When the template is selected, the program uses the face detection algorithm to rotate and crop the image to the selected standard automatically, so that you get an appropriate ID photo without any efforts. In addition to the default catalog of templates, the passport photo software allows you to add custom photo types. Once the image is cropped, you can do some editing. For example, you can correct brightness and contrast, retouch the image and remove red-eye. The program can automatically change the background and fill it with any color. The finished photo can be saved to the hard disk drive or sent for printing. In the latter case, you can select the type of paper, orientation, choose the number of photos per page and add crop marks. As a result, you get a perfectly finished set of ID photos on one page complete with crop marks to make cutting easy. Passport Photo Maker has some features which are intended for digital photo studios. For example, there is a module for tracking income and orders, as well as a log of actions. Also it is possible to set different access rights for the management and employees to enable effective use of the passport photo software.